Choi Seung-hyun (Hangul: 최승현; born November 4, 1987), better known by his stage name T.O.P, is a South Korean rapper, singer, songwriter, record producer and actor. 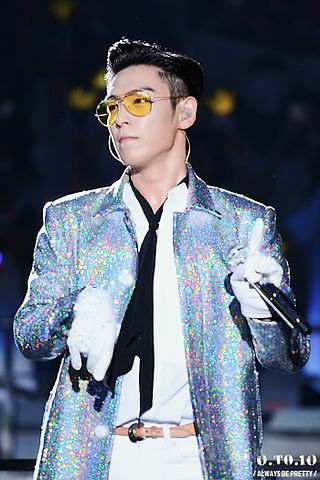 T.O.P rose to fame in the mid-2000s as one of two rappers in the hip hop boy band Big Bang under South Korean record label YG Entertainment. The group became one of the best-selling groups of all-time in Asia and one of the best-selling boy bands in the world. In 2010, while the group was on hiatus, T.O.P and G-Dragon collaborated to release the album, GD & TOP. As a solo rapper, he has released two digital singles, "Turn It Up" (2010) and "Doom Dada" (2013), which has peaked at number two and four, respectively, on the Gaon Digital Chart. T.O.P ventured into acting at the advice of Yang Hyun-suk, beginning with the TV series I Am Sam (2007), Iris (2009), and the TV movie Nineteen (2009). He made his film debut with 71: Into the Fire (2010), for which he received praise, and won multiple accolades including Best New Actor at the 2010 Blue Dragon Film Awards and the 2011 Baeksang Arts Awards. Subsequently, he garnered lead roles in the films Commitment (2013), for which he was awarded New Asian Actor of the Year at the Busan International Film Festival, and Tazza: The Hidden Card (2014). A New Collection of oneshots. Gtop with special appearences of others. The separation of Military Enlistment is a cruel thing but it could also provided something Jiyong and Seunghyun both seem to need: time and space. The space to decide what they mean to one another and what they want for their future. Fate and emotion can only go so far to help them, however. In the end whatever paths Fate provides, it is only by choices made, or taken, that they can be walked. The runners running into each other while running.